Easily manage your daily operations. What is a Property Management System and why do you need it? PMS, short for Property Management System, is a hotel management software used for reservation, availability and occupancy management, check-in/out, images, guest contacts, report generation etc. This application is used in-house (in an individual hotel) to control the onsite property activities. In today’s super-competitive, ever-changing hospitality marketplace, lodging businesses such as Hotels need comprehensive, fast and easy software automation that covers every part of their operation, in order to maximize operational efficiency throughout the property and meet the demands of travelers. This is why a next-generation Property Management System is a must for a hospitality business. InnGenius PMS solution allows hoteliers to do what they do best: deliver superior guest experiences and produce the company’s desired business results in terms of revenue and profitability. 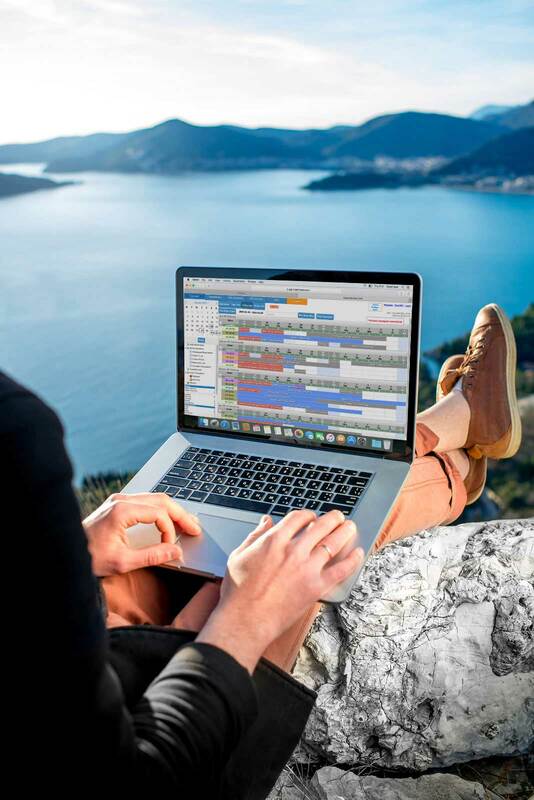 InnGenius Hotel PMS Software packed with easy to understand yet powerful features and makes it easy for you to manage your daily tasks while increasing your productivity and guest satisfaction. InnGenius is built with the help of a dedicated team of hospitality experts. InnGenius PMS is able to meet the demand of most intricate operational requirements. In today’s’ hospitality industry, a great property management system should not only save you time and money but increase your revenue and productivity. InnGenius is a revolutionary Saas (Software as a Service) hotel software (PMS) system built in cloud technology. It is designed to meet the demands of small to medium size hospitality businesses. Behind a simple user interface is an innovative hotel management software that satisfies even the most intricate operations. Thanks to cloud technology, Inngenius is the most affordable Hotel Software (PMS) / Channel Manager / Booking engine out there. Simply signup for a free trial and if you like it, subscribe and pay a low reasonable monthly fee. There are no royalties or hidden fees, and absolutely no contracts. All services Inngenius provides are included in the price. Here at InnGenius we provide all the services that you need, hotel PMS software for your daily operations, channel management (CRS) to distribute your rooms and a booking engine for your hotel website. Increase your revenue by distributing your room availability and rates to hundreds of global and regional online markets. InnGenius hotel management software is the perfect solution for most types of properties. it’s used in hotels, motels, resorts, RV parks, B & B’s, camp grounds, clubs, vacation rentals, hostels, apartment rental portfolios. 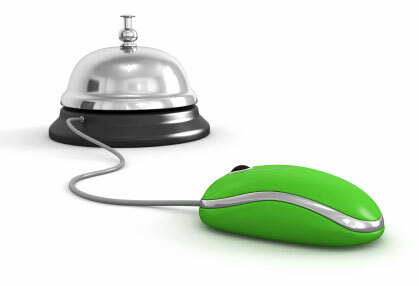 InnGenius PMS Hotel software has a wide range of add-on modules to cover every aspect of a hospitality business. InnGenius is globally accepted due to it’s cutting edge technology and ease of use. InnGenius hotel software offers easy check-in and check-out, processes and a single click guest reservation or available room filtering. Group reservation management, housekeeping, night audit, guest history, direct billing (City ledger accounts), Hotel POS, analytics and a lot more. InnConnect hotel channel manager helps hotels manage their inventory accross many OTAs and GDS networks. It will sync hotel rates and room inventory automatically. 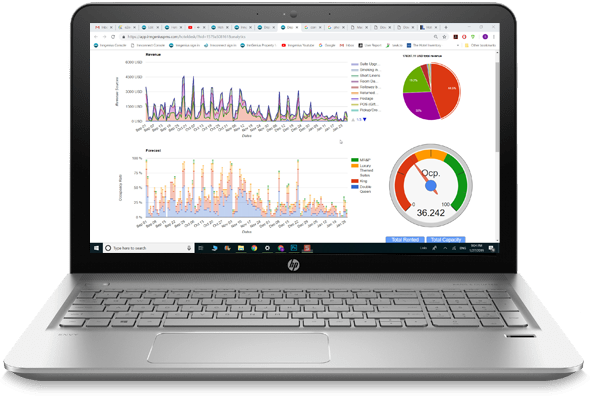 InnConnect is one of the FASTEST channel managers on the market with the lowest rate of overbookings. InnConnect Hotel online booking engine helps hotel increase their revenues by adding a reservation capability to hotels website. This implementation helps hotels increase their commission free bookings. 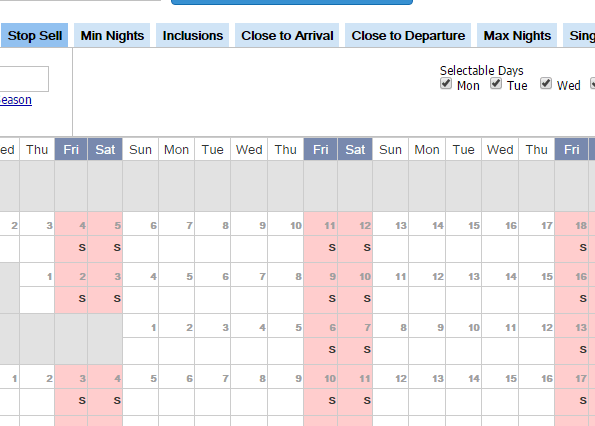 InnConnect Hotel Booking Engine features two templates to choose from. It's also mobile responsive that allows your guests to reserve rooms from their mobile devices. 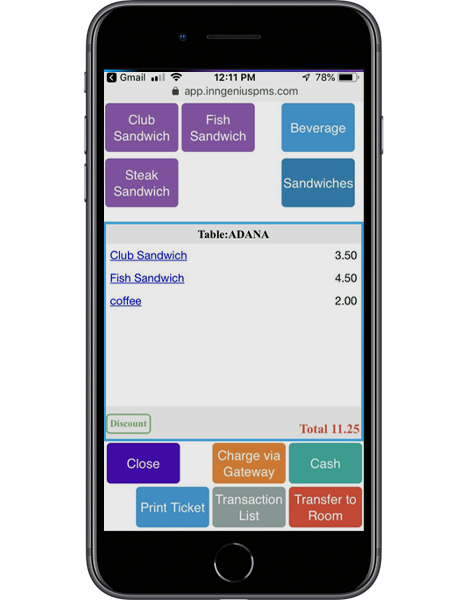 InnGenius POS is highly customizable with great features. It will allow your servers to take orders on mobile devices at the guest’s table. It’s ,easy to navigate screens, increase productivity in high traffic enviroments. InnGenius POS allows multiple tax rates to be used for retail items. It can track several tables/tickets at the same time just like a restaurant POS. Cloud-based InnGenius can run on any operating system and its accessible from anywhere in the world, all you need is a computer with an internet connection. InnGenius is the perfect solution for properties with off-site personnel, as well as properties with multiple locations. InnGenius Report Server brings accurate data ondemand. Create a custom link and access your analytics and report data on any device, any time. Your data’s safety is paramount to us. 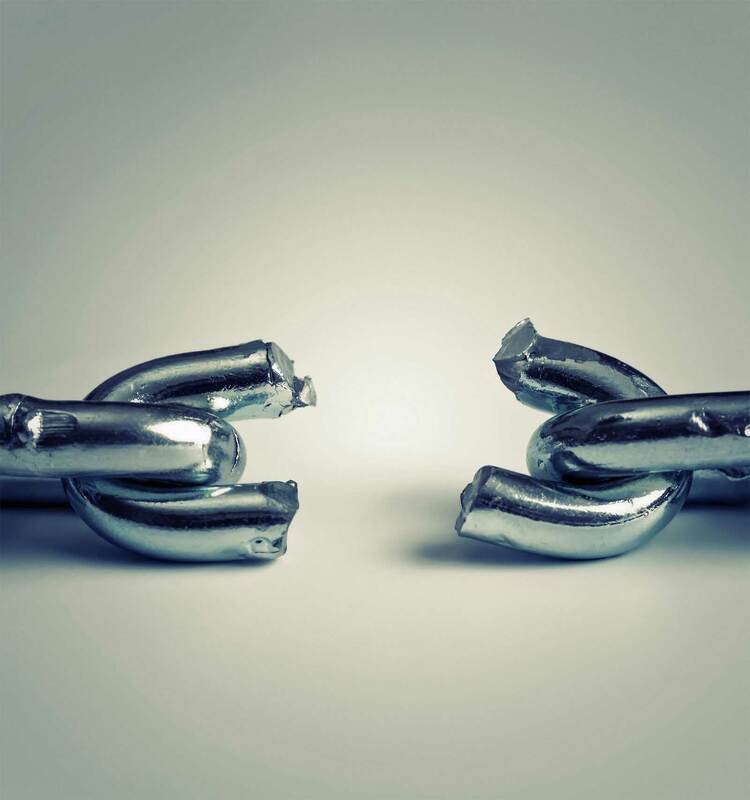 Here at InnGenius, we use 256-bit SSL encryption for all the data coming in or going out. We regularly run penetration tests on our PCI compliant servers to make sure nothing is put at risk. Save money and time by integrating all the essentials together such as; Hotel front desk management, Channel management, Booking engine, Room services and POS points. Focus on your guests and profits, and not paperwork. Customized to your specific requirements, InnGenius offers a variety of training and support services. Our team of technical professionals are here to walk you through the implementation, training and product support. At a glance house status showing occupancy, check-ins, check-outs and head count. Accept multiple payments in different payment types for any reservation. Create derived/duplicate rates with pooled inventory. 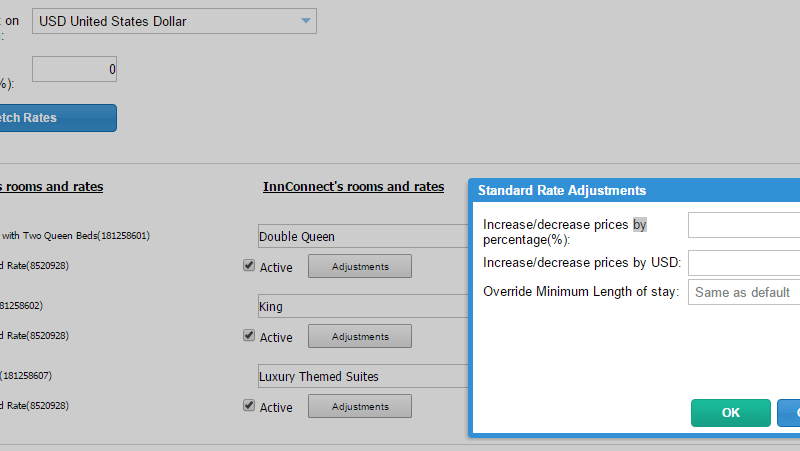 Inngenius automatically changes the occupied rooms statuses to “Full Service” after certain period of time. A great function to seperate daily housekeeping and through room cleaning. A great function to sell small or large items in a retail site within your property. Easy to use retail screen can be used in several setups within your property such as renting recreational equipment, food items, souveniers or you can even run a small store. 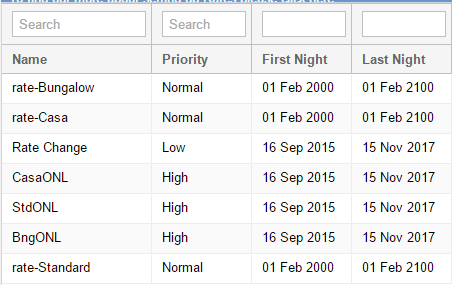 On demand Stop sell feature to manage reservations coming in on certain dates. 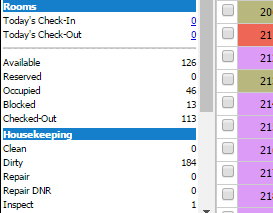 Setup occupancy or room based rates. Adult and child rates can be entered separately. Add remove variables to guest receipts, registration cards. Rename receipt heading and hide/show content before printing. Create work orders for malfuntioning equipment and rooms. Set-up work order priority for rooms in high demand. A true PMS solution helps increase your sales and guest satisfaction! Apply multiple taxes to rates, fixed or various. InnGenius POS screen is designed to be used in touch screen computers. Expanded touch button menu layout is designed for faster order processing. Apply multiple rates to a single room type. 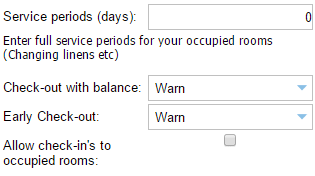 Assign various or fixed rates for each individual room in a party reservation. Assign daily or a fixed rate for the whole stay. What is PMS in a Hotel? 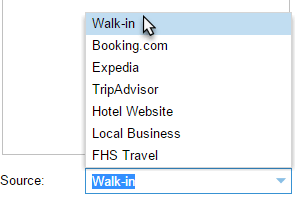 Create direct access links for travel agencies to enter reservations directly into inngenius with only few clicks. Special rates or discounts can be applied to these direct access links. 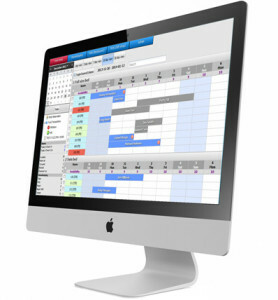 Enter daily,monthly or yearly rates within minutes on a calendar screen. 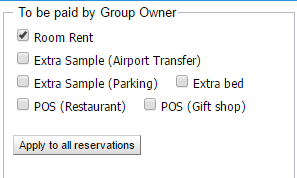 InnGenius allows users to transfer balance for POS charges to room folios of group or individual reservations. Mostly used by hotels with restaurant/bar facilities. 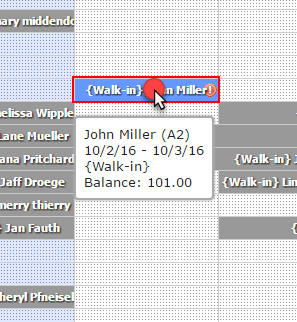 Mouse-over to any guest name while in calender chart for head count, payment status, balance, rate and check-in/out dates. State of the art available room selector for hotels with high occupancy levels. Easily filter available rooms for fast reservation and check-in. Housekeeping and occupancy status of each room can be tracked easily by color coded room numbers and days on calender chart. 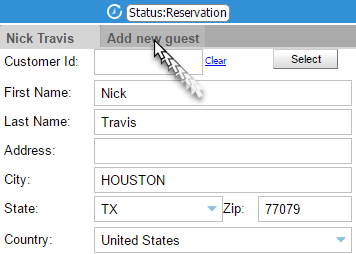 Add additional guest information to folios. Transfer charges between an individual and party reservations with one click. Setup your account to send out room status emails to housekeeping staff automatically. Keep your housekeeping staff updated on their to do list before their shift starts. No more wasted time in scheduling and arranging room lists to attend. Check-in & out on the calender screen with 2 clicks. Workorder list is designed to keep maintenance staff in the loop. You can easily close-out rooms with maintenance issues and let your staff know about the issues. Enter updated info to workorders to keep track of prior work. 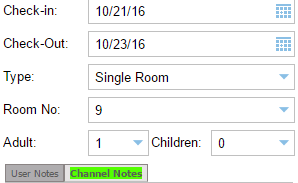 Apply a single rate to multiple room types. 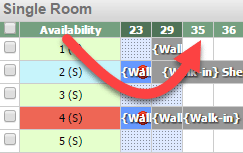 Search function for locating guests, folios and room types or numbers in the calendar chart. Create multiple rates for every room type seasonal or year-round. Assign minimum/maximum stay restrictions or date based restrictions. Adult and child entries with automatic rate adjustment. Transfer a folio to a group account or remove it from a group reservation. Add incidentals, add-on/extras to folios from any POS point or from the frontdesk with options of daily recurring, one time or a fixed price. Setup rate adjustment based on sales channel. Most commonly used for commission compensation. Source of reservation; Travel Agents, Expedia , Website , Walk-ins etc. can be configured for tracking your sources. Guest information ID number, Nationalities, Passport numbers can be entered into guest folios. US Id’s with magnetic stripes can swiped with a credit card reader to easily enter guest info such as guest’s age, address etc. InnGenius boasts a state of the art analytics with very important occupancy metrics such as revenue, occupancy forecast , adjusted daily revenues, revenue parity etc. 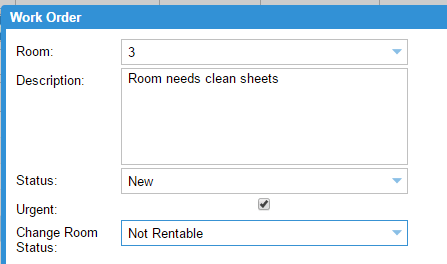 Easy to filter based on dates, room types, occupants etc. InnGenius Analytics comes with all subscription options and is free of charge to all the users. Number of available rooms are in plain sight. Click and drag your mouse to mark the calender days for rate entry. You can also click on a months and days to choose them entirely. Easy access to reservation information such as room type or room numbers of any reservation. 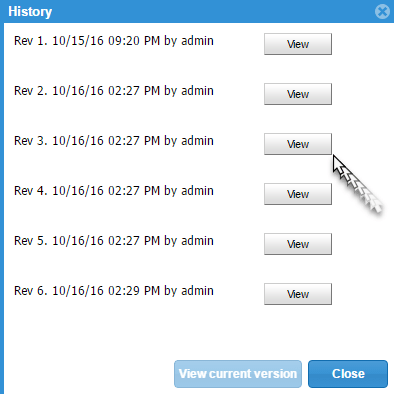 Access snapshot history of any reservation since it’s creation date. Great function to track account history and users. Payment routing can be set easily for an individual room or for all the rooms in a party reservation. 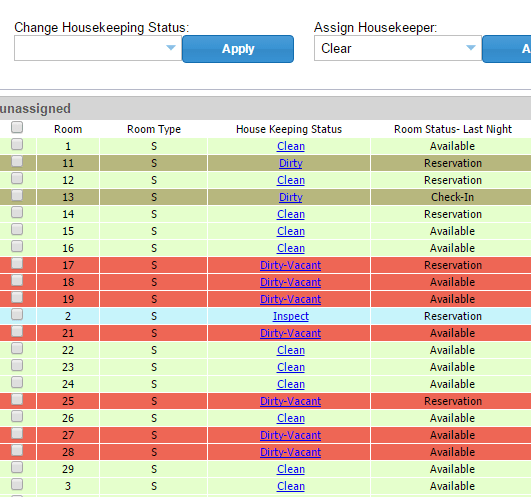 InnGenius housekeeping module automatically changes the room status depending on guest’s check out status. 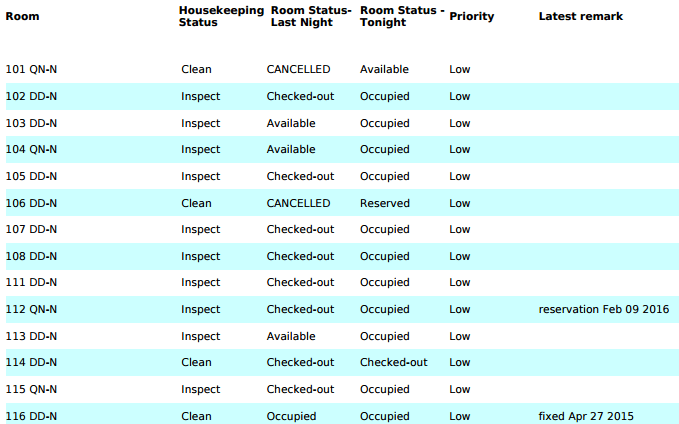 Checked-out rooms are automatically marked as dirty. Stay-over rooms are marked inspect. Unattended rooms will be marked as dirty with a different color to warn the frontdesk staff of the issue. Create a menu with your most used/favorite reports for easy access. InnGenius is the industry’s most advanced and stable guest-centric cloud-based hotel management software. InnGenius adapts to the needs of all types of properties, allowing you to work the way you want. I change Channel Manager Supplier to Inn Genius. And till now I think is a very easy system to use. They have very good customer service and support. Have 1000 of videos for every issue. Very Flexible. Till now it has fit perfectly to our needs. Awesome system. Easy to use and believe me they are always there to help for everything you need, they have great customer service. A high quality PMS system with a good price. You totally can find whatever you want to know about you hotel. I found Inn-genius 3 years ago, the same year when they were founded. The very first thing i noticed was the prompt and polite support response which is always the same. The software is extremely easy and generates great reports having a huge impact on my business. I couldn’t be happier and look forward to keep growing and collaborating together. 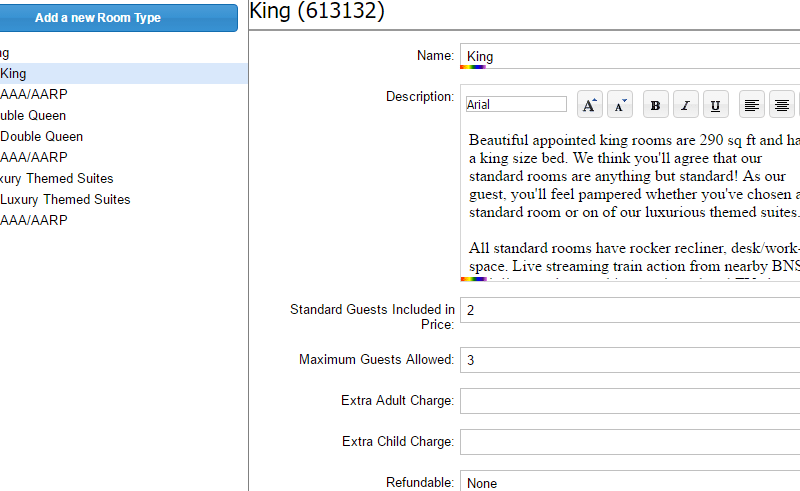 Being hotelier i will undoubtedly recommend this software.. The pms is easy to use, it covers all the needs of our hotel and the customer support is always there for you. I would definitely recommend to all properties that are looking for a pms that is cloud based, friendly, has great value for the money, and the customer support is super fast. In other programs, I was loosing thousands due to a mapping issue or hidden default pricing and couldn’t get the issue resolved. Inngenius has never deflected an issue and I appreciate the accountability, problem-solving, and quick response to product enhancement. Also, the refresh rates must be really quick because I have NEVER had an overbooking. Thank you Inngenius. “Was looking for a suite that was able to handle the tasks required by large hotels but targeted at small boutique properties. INNgenious gave us all we needed at a great price point. “This system has everything you need to keep track of your hotel management. Bridge the gap between your property and companies you work with. We built certified 2-Way XML connections to industry leading online travel agencies/GDS networks and payment gateways.